Artists across Canada work with PWM to enrich and evolve their creative practice. We engage collaboratively in deep explorations of story, theatrical form and process. PWM collaborates on new works for performance. These works include but are not limited to plays, works of devised theatre, and interdisciplinary performance. When submitting your project for consideration, you may send a full script, a scenario, a proposal, or any other material that you believe best conveys your project. In order to submit a project, playwrights/creators must have had two professional or fringe productions, or one published play. An eligible playwright/creator may submit a maximum of one project per year. In addition to unsolicited submissions, playwrights are invited to submit their project to the Gros Morne Playwrights’ Residency. Learn more about the residency here. 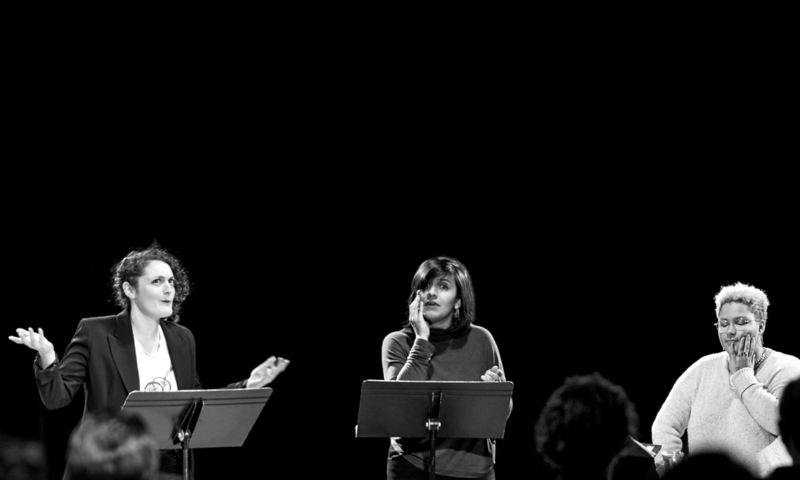 In order to submit a project, translators must have had at least two translated plays produced or published. An eligible translator may submit a maximum of one project per year. Note: While translators may submit translations and receive dramaturgical feedback, priority for translation workshops will be given to projects that have the the interest of a producing or publishing company. In addition to submitting unsolicited work, translators are also invited to apply to PWM’s Glassco Translation Residency in Tadoussac. Learn more about the residency here. In order to submit a project, emerging artists must provide proof that they have graduated from a recognized post-secondary program in theatre or creative writing OR present two letters of introduction from Canadian theatre professionals. An eligible emerging artist may submit a maximum of one project per year. Artists under 30 may also wish to apply to PWM’s Young Creators Unit. Learn more about the program here. Professional Canadian theatre companies may submit projects for development. If your company has never worked with PWM before, please include a brief description of your company with your submission. Please send your project submission and the required information confirming eligibility to dramaturg@playwrights.ca. There is no fee to submit a project. For accessibility support in submitting your project, please contact Jesse Stong at jesse@playwrights.ca. – You can expect a response in 1-3 months. – We guarantee that every eligible submission will be read by a PWM dramaturg. – The artist may be invited to meet with a PWM dramaturg to discuss the project and receive feedback. – After this meeting, a dramaturgical assessment of the work will be forwarded to the artistic director and put into consideration for further development. – In certain cases, a PWM dramaturg may instead direct the artist to a different dramaturg or institution better suited to the project. If you are interested in dramaturgical consultation for your project but do not meet the criteria listed above, PWM will initiate one feedback session for your project with a professional dramaturg. The cost of this one-time service is $125. If you are interested in this service please send an email to dramaturg@playwrights.ca and put “dramaturgical referral” in the subject line.